I remember my childhood fondly, especially the early years. For the most part, my days were filled with games, including those I invented with my siblings and neighborhood friends (indoor hockey using ski poles and plastic doll plates, anyone? ); explorations of the surrounding neighborhood; and tons of problem-solving. Whether it was figuring out how to create a go-kart out of bicycle parts or hammering out the rules for whatever we were playing, we were, in general, left alone to figure these things out on our own. My parents had never heard of social and emotional learning (SEL), but they nurtured it in us simply by letting us be kids. CASEL defines SEL as “the process through which children and adults acquire and effectively apply the knowledge, attitudes, and skills necessary to understand and manage emotions, set and achieve positive goals, feel and show empathy for others, establish and maintain positive relationships, and make responsible decisions.” Through creative, hands-on play, my siblings and I honed our SEL skills without even realizing it . . . except, it seemed, in school. School was always structured, with little time for creative thinking and social interaction. Luckily, that has begun to change. Take, for example, Harmony Science Academy – Cedar Park in Austin, Texas. The folks at Harmony recognize how important SEL is, especially at the elementary level, and they have set up an environment and culture that naturally develops SEL skills. An important part of the Harmony environment is the two Pitsco Education STEM labs: one with K-2 STEM Units that interconnect social and academic competencies; and the other with Grades 3-5 STREAM Missions, which pair core science instruction with reading, art, engineering, and math application. In both programs, students work in four-member teams, learning social skills, teamwork, and empathy, working through problems by relying on each other. The experience has helped build the students’ confidence, reducing the emotional meltdowns typical of elementary students. Knowing that they will eventually work their way to a solution gives students the boost they need to keep trying. Equally cool are the hands-on activities that immediately engage the students, making them want to learn more so they can do the project. The STEM Units include designing and building structures; exploring movement, time, and angles by studying theme park rides and roller coasters; learning to design, decorate, and make their own packages; and completing design challenges based on various literary sources. (For a great example of this, see how Angela Witt implemented the Exploring Structures in Literature STEM Unit.) 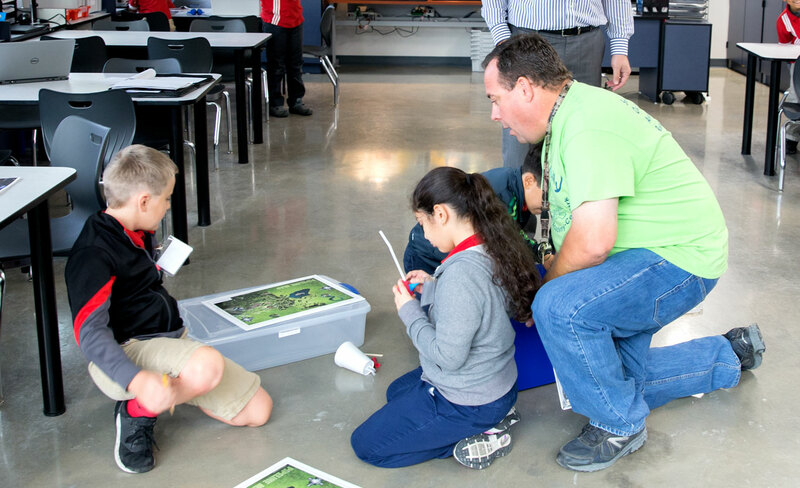 In STREAM Missions, students create a bone composition model, plot crewed and uncrewed landing sites on the Moon, reconstruct a model of a crime scene, design and build straw rockets, create magnet paintings, engineer ear trumpets, and much more. Sure, it’s not the same as creating a go-kart out of bicycle parts – it’s much better! Learn more about Harmony Science Academy’s progress in The Pitsco Network magazine articles “Addressing social and emotional learning in first grade” and “The STREAM solution for any type of learner.” You can learn more about Pitsco’s elementary curriculum on our K-2 Programs and Grades 3-5 Programs pages.